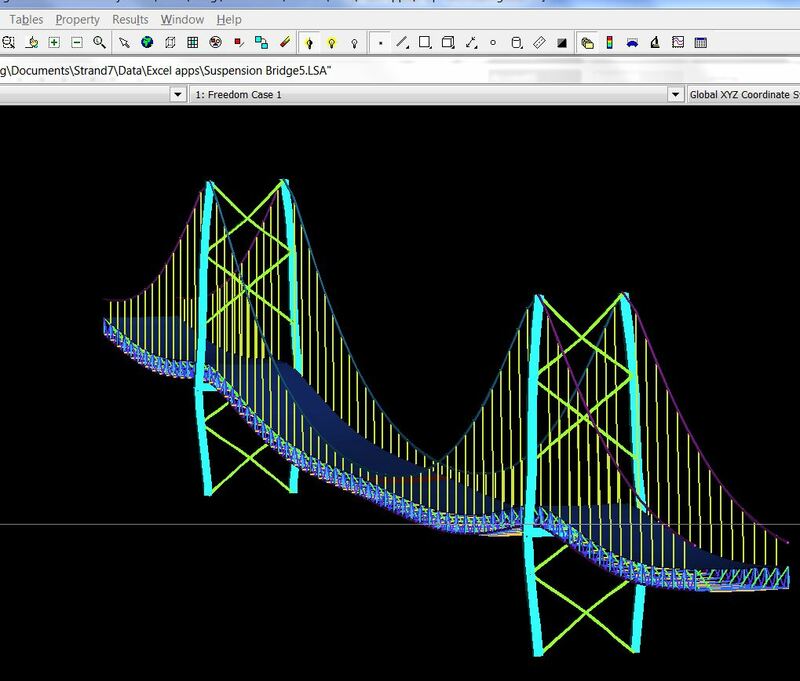 Strand7 is a general purpose Finite Element Analysis program, which has an Application Programming Interface (API), allowing external programs to interact with Strand7, including reading and writing to data files, running analyses, and reading the results. The API is a comprehensive program, allowing control of almost all aspects of the software, but it is also very complex. The manual consists of over 1000 pages of detailed technical information for instance. To make the API more useable in a design environment I have written an Excel based front end, allowing the main functionality of the API to be accessed without programming, through a series of VBA routines and User Defined Functions (UDF’s). 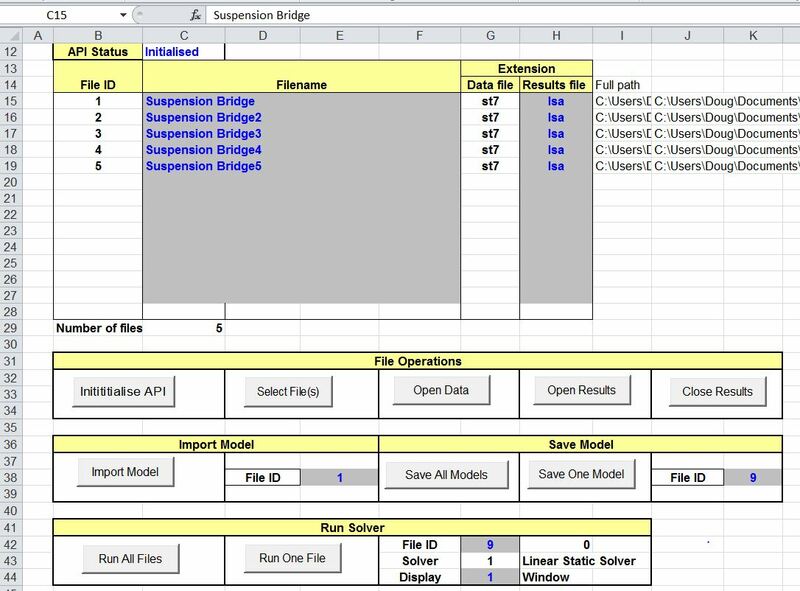 A demonstration version of this spreadsheet may be downloaded from S7 API Tools.zip. 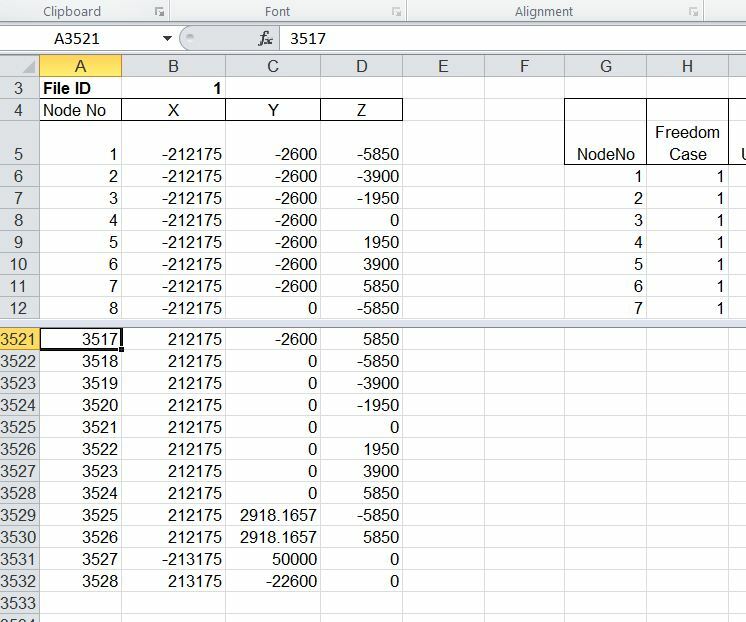 Unlike the other software on this site, this spreadsheet is intended for demonstration purposes only, and all the VBA code is hidden. Future post on this blog will however cover the main elements in setting up an API application, including open source code. 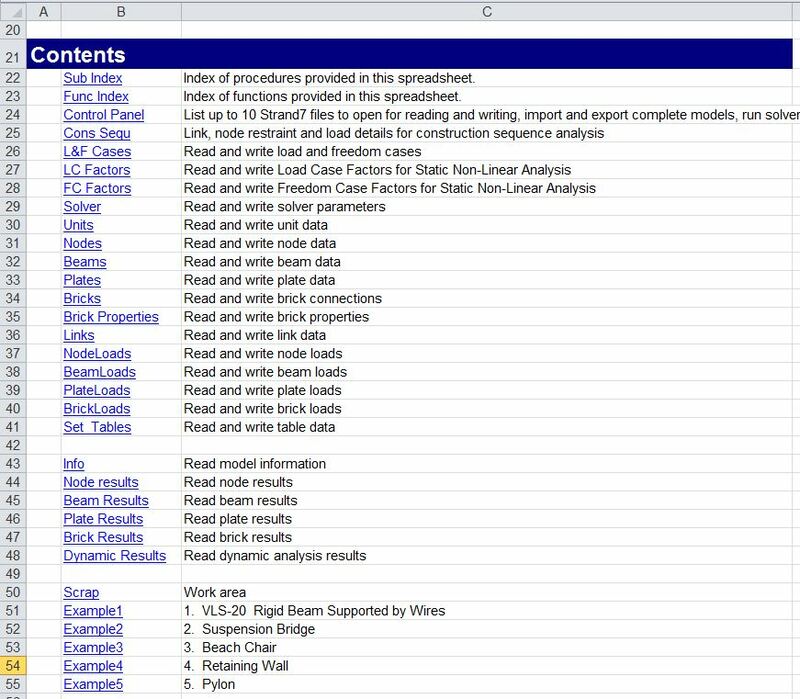 The features of the spreadsheet are listed in the two screenshots below. Deflection results imported into Excel. Strand7 Results View, showing deflections with 50x magnification. 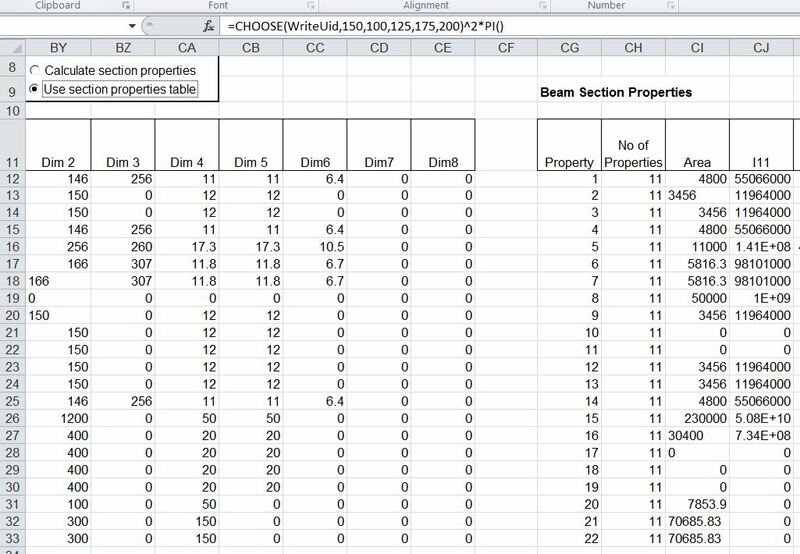 This entry was posted in Excel, Finite Element Analysis, Frame Analysis, Newton, UDFs, VBA and tagged API, Excel, Finite Element Analysis, Strand7, UDF, VBA. Bookmark the permalink. Hi there. Where can i find this software? thanks for the entry btw. I found it helping. If you are interested in a specific application please contact me at dougaj4 at gmail. Sorry I write out of the blue… I am a M.Arch student working on a thesis about Morphogenetic Cellular Sturcture as a micro-evolutionary urban vehicle in Reykjavik, Iceland. 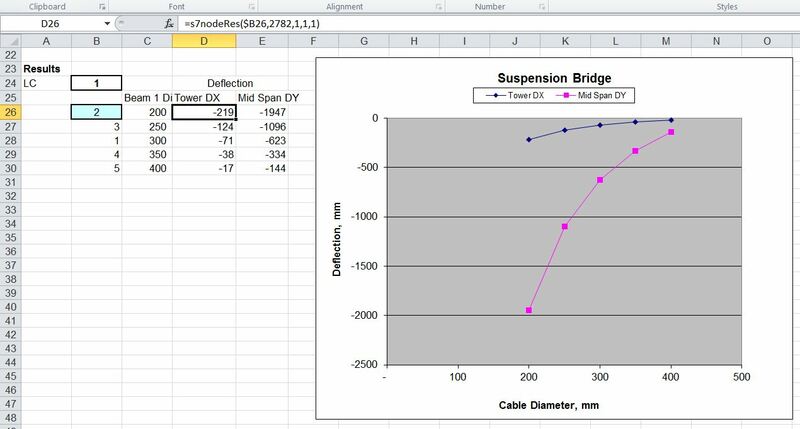 Umm, since my progress has reached the stage that I have tried to incorporate Strand7 into the structural analysis, and it would be very helpful to get technical advices since I can’t really find anywhere else that talks about Strand7 much.. I have built the structure model in Strand7, but, for some reason, and believe me I have been reading the manual for days and still can’t figure out why.. that I can’t post-process the results to change the results settings and set diplacement scale etc..
Is dougaj4@gmail.com your email if you don’t mind I could attach things and see if you could kindly show me some pointers..? Many thanks in advance. I have written a research paper in parallel with the thesis that my architectural proposition is anti-masterplan. Master-planning = macro; micro urban vehicle is to go without a dictator-type of authority, but something that triggers individual participation among citizens.. Evolutionary as in the urban growth happens in chapters, or episodes, it’s not a one-off. If that helps…? And hope you got my email too?